Ariane Daguin of D'Artagnan, the company that first distributed foie gras and now sends high-end organic meats and poultry to restaurants around the country, is in Boston this week for the aptly named Blizzard Bash, to be held tomorrow night, even if the storm is bad. She is the daughter of famed French two-star chef Andre Daguin of Hotel de France in Auch, Gascony, which he ran for almost 40 years, and where he was known for his foie gras. When I first heard about him from Paula Wolfert ("The Cooking of SouthWest France"), I asked a friend if she wanted to go to France on an eating tour. We drove from Paris to Auch, with an overnight stay in the charming Medieval town of Sarlat in the Dordogne, and didn't allow enough time to get to the restaurant. We were way past our lunch reservation and the hostess didn't want to let us in, even though I pleaded in my horrid French. Chef Daguin came out of the kitchen, insisted we sit down, and cooked us foie gras in so many variations we were dizzy, all accompanied by armagnac in round-bottomed glasses (you couldn't set them on the table till they were empty). I always wanted to tell M. Daguin what a wonderful moment that was. So I told Ariane instead last night over dinner at Oleana. She and former partner George Faison began D'Artagnan in 1984, shipping foie gras to restaurants. Today, D'Artagnan sends out 32 trucks with pork, beef, lamb, and chicken deliveries from Southern Maine to Washington, D.C.; there are more trucks in the Midwest. She says, "I was extrememly lucky" about the timing of the business. Young chefs from the CIA and the International Culinary Center, known then as the French Culinary Institute, along with trainees from the late Peter Kump's cooking school, were changing the landscape of cooking with their trendy ideas. She travels around the country talking to farmers who want to raise organic meat to her specifications. 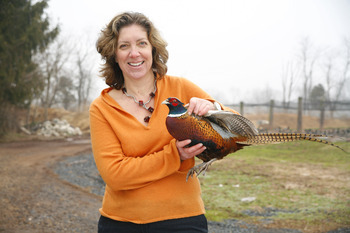 Animal husbandry isn't a huge stretch from what she grew up with, she says. Her grandmother regularly made confit from duck breast (a cut we now see seared and served rare). When someone brought an animal into the restaurant, she would go in to help break it down into cuts. Her meats and poultry cost more ("double the price of commodity meat," she says), because they're fed better, and growers pay real attention to the words "free range." Pork comes from Berkshire pigs in the foothills of the Ozarks, Waygu beef from a female rancher in Texas, lamb from Colorado, rabbits and chickens from Amish in Pennsylvania and Indiana. "They think like we do," says Daguin about the Amish farmers. " 'My father gave me this soil, I will give it to my children in better shape.' They have respect for animals." When she sees what passes for organic chickens in some markets, she is very surprised. Commodity chickens are 35 days old when slaughtered. D'Artagnan chickens are 80 days. The famous French Poulet de Bresse, raised to government standards, are 120 days, she says. "When you look at chicken in dollar signs, it's what it ate. Labor, transportation are nothing compared to the food costs." She's grateful to today's restaurateurs, who seek out good products. "The priorities of chefs is to have the best possible ingredients on the plate," says Daguin. "That's what's allowed me to have a business all these years."